Stephen Hawking is no ordinary scientist. With a career that began over forty years ago at Cambridge University, he has managed to do more than perhaps any other scientist to broaden our basic understanding of the universe. His theoretical work on black holes and his progress in advancing our knowledge of the origin and nature of the cosmos have been ground-breaking, if not downright revolutionary. Stephen Hawking has also spent much of his adult life confined to a wheelchair, a victim of ALS, a degenerative motor neuron disease. Clearly his physical limitations have done nothing to confine him intellectually. He simply never allowed his illness to hinder his scientific development. In fact, many would argue that his liberation from the routine chores of life has allowed him to focus his efforts more keenly on his science. Hawking certainly would have been remarkable for his cutting edge work in theoretical physics alone. However, he has also managed to popularize science in a way unparalleled by other scientists of his stature. He became a household name, achieving almost cult-like fame, with the release of his best-selling book, A Brief History of Time. Although steeped in the potentially overwhelming complexities of cosmology, he succeeded in selling millions of copies to audiences eager to learn even some of what he has to offer. Science writers White and Gribbin have skillfully painted a portrait of an indefatigable genius and a scientific mind that seemingly knows no bounds. 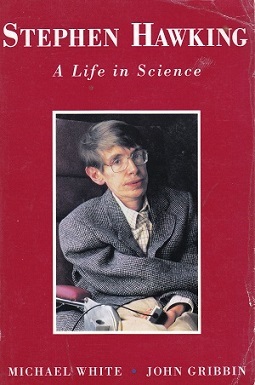 Knitting together clear explanations of Hawking’s science with a detailed personal history that is both balanced as well as sensitive, we come to know and appreciate both.